A prototype is an original model of something from which other forms are developed. Depending on how complex the prototype is, it can test a new concept, or in my case, it served as a visual sample that designers could use to make a final product. When I first came up with my idea for a wrist water bottle, I tried to explain the concept to people, and most just couldn’t visualize it. They were picturing a regular water bottle strapped to your wrist. This is because we tend to see what we already know. Scientists refer to this as “structured imagination”. In other words, when we try to imagine something new and unique, our brains are still stuck in existing concepts and ideas. That’s why everyone pictured a regular, existing water bottle strapped to the wrist. Most people simply cannot picture a brand new concept. And you don’t want them to imagine the wrong concept. This goes for products, websites, scripts, books, and any other creative endeavors. No one else is going to imagine exactly what you imagine in your mind. I knew if I was going to explain what it was I would have to make a prototype model so it would be obvious. A first prototype doesn’t have to actually work, so it can be made of anything. I went to the art supply store and bought a variety of supplies to work with like clay, string, popsicle sticks, paper clips, styrofoam, ribbons, etc. 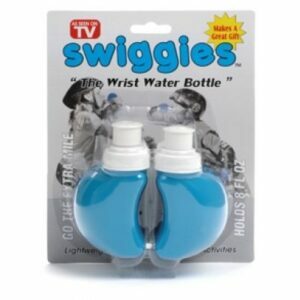 The first wrist water bottle design was made of clay, ribbon and an off-the-shelf cap. It was bulky and goofy-looking, but once people saw it they were instantly able to visualize the concept. It was also the first and only prototype I made before taking the clay model to a mold maker. Making the prototype enabled me to go from an abstract idea in my head, to a physical item I could hold in my hands. It was also helpful to be able to see where the flaws were instantly as opposed to guessing about them. One of the flaws I wouldn’t have guessed was in the weight of the bottle when filled with water. By putting the heavy clay prototype on my wrist, I realized it would have to be a little smaller since it would be filled with water. It had to be just the right size. Not so big that it would be top-heavy, and not too small, so you would get enough water for a normal run. The mold maker was also better able to see the concept and instantly figure out where the flaws were and how to fix them. The same goes for designing a website, marketing materials, video games, or anything else that will be handed off to a designer to make a final product. The TV and film industry uses storyboarding in order to show visually what the entire product will look like. In fact, we did a storyboard for the TV commercial we used for the wrist water bottle before we shot it. My main goal as the innovation keynote speaker was to prove to the scientists and engineers that prototyping didn’t have to be complicated, time-consuming, risky or expensive. One valuable thing about prototyping is that you get instant feedback. When I showed people my clay prototype, people had lots of questions. By actually seeing something that would resemble the final product, they were able to see things I hadn’t thought of. Having a good prototype allows you to make changes before you invest a lot of money in a product. So prototyping is actually less risky. Prototypes don’t have to be expensive. The one and only prototype I had cost less than $10. If you’re just making a prototype to show others a general idea of what it will look like, it can be made out of materials from an art store, like I used. A working prototype is more expensive, but can be done using 3D printing, fabrication and off the shelf parts, like I did with the cap. It will still be less expensive going this route first before investing a lot of money in a final product. If you find out something doesn’t work you can easily fix it in this stage. The basic design of the bottles and the caps didn’t change, but the material of the bottles and the bands did change. The original bands were made out of terry cloth. They were soft, but didn’t stay on very well and were thick and bulky, which made threading them through the loops difficult. The idea for the new bands came from the medical industry. One of the most important concepts about innovation is that you should always be looking to get ideas from other industries. By looking in the medical industry I was able to find a material called vel-stretch that was thinner and more durable. It’s easy to thread them through the bottle loops and they fit more snugly than the terry cloth. I was happy when several scientists and engineers came up to me after the speech and said they were now excited about prototyping. They were finally convinced that it wasn’t as complicated or risky as they thought. My journey through the invention process itself was long and difficult, but the prototyping part was rather quick and easy, and was the least expensive part of all.